Elizabeth I’s father, Henry VIII played hard. He hunted, sung and danced and wrote or stole, hedonistic music. His polyphonic elaborations on Taunder naken are so brilliantly clever it’s doubtful that he really wrote them! For Elizabeth’s mother, Ann Boleyn, life became suddenly all too short when she was executed by Henry’s command. O Deathe, Rocke me Asleepe was ostensibly written by her on the night before her execution. Beginning with music by Elizabeth I’s parents, the programme then moves on to some witty love songs, nifty ornamentations and brain-twisting Fantasias: by John Dowland, Thomas Tomkins and Orland Gibbons. American composer Will Ayton adds new harmonic colours to Dowland’s Go Crystal Tears. 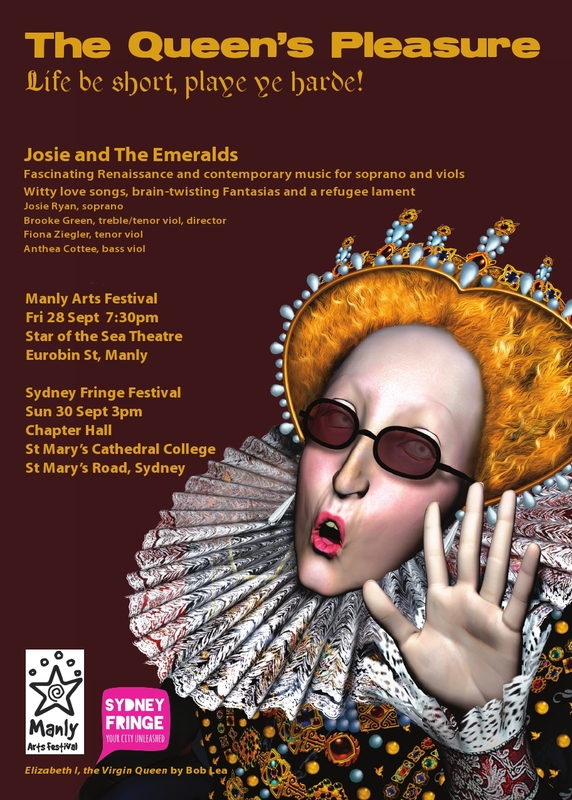 Brooke Green has arranged two new works for the ensemble: Australian composer Elena Kats- Chernin’s hypnotic Eliza Aria and Andrea Pandolfo’s Albanese, a tragically beautiful lament of a bereaved asylum seeker. Hi. Would like to go to this. How do I get tickets and how much do they cost?